Fraser, S. and Moore, D. (eds.) (2011). 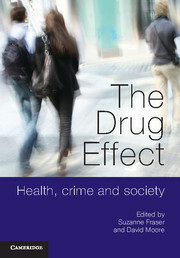 The Drug Effect: Health, Crime and Society offers new perspectives on critical debates in the field of alcohol and other drug use. Drawing together work by respected scholars in Australia, the US, the UK and Canada, it explores social and cultural meanings of drug use, and analyses law enforcement and public health frameworks and objectives related to drug policy and service provision. In doing so, it addresses key questions of drug use and addiction through interdisciplinary, predominantly sociological and criminological, perspectives, mapping and building on recent conceptual and empirical advances in the field. These include questions of materiality and agency, the social constitution of disease and neo-liberal subjectivity and responsibility. This book provides a fresh scholarly perspective on drug use and addiction by collecting top quality original work, written by a mix of international leaders in the field and emerging scholars working at the cutting edge of research. Reviews: The Drug Effect: Health, Crime and Society draws together a collection of readings from diverse disciplines and national and international contexts. Scholars in the fields of gender studies, sociology, criminology, policy and practice, and science and technology studies, as well as the law, have been brought together by editors Suzanne Fraser and David Moore to provide a compelling account of the intersection of these disciplines … For a reader with a background in sociology and social policy, I found the book captivating from Introduction to Index. Each chapter provided an insight into drugs and addiction that was elegantly and subtly expressed. On this basis then I recommend the book highly to all interested readers. In The Drug Effect: Health, Crime and Society, Suzanne Fraser and David Moore have collected a range of voices that question the objectivity of the scientific approach, and, more fundamentally, the ‘epistemological naiveté’ of positivism – that is, the view that it is possible to produce objective, value-free knowledge about the world … The result is a fascinating collection of perspectives, in three parts.